In the late 19th Century Britain began to probe into Central Africa, both from the Indian Ocean through Portuguese East Africa and northwards from Southern Rhodesia. The motives for entering the region around Lake Nyasa, (declared the British Central African Protectorate in 1891 but later called Nyasaland and now named Malawi), were a mixture of public concern about the ruthless practices of Arab slavers as exposed by Doctor David Livingstone and other Scots Missionaries, and more pragmatic reasons of trade and commerce. In those days the British government frequently saved overseas costs by licensing trading companies to explore and develop new territories. These trading companies often possessed rather different principles and priorities than those of Doctor Livingstone, and very often local Chiefs and their tribes were taken advantage of by unscrupulous traders. In British Central Africa the African Lakes Corporation, an organization headquartered in Glasgow, was the dominant trading concern from 1884 until the Protectorate was declared in 1891. Between 1888 and 1896 Britain had fought against a number of Arab slave-raiders and their African allies operating around Lake Nyasa. This confrontation was known as The Slavers’ War. As this war developed the British recruited white mercenaries from South Africa, Sikh soldiers from India, and engaged local tribesmen as irregular soldiers. The Angoni had been considered for recruitment but as their villages were full of slaves from other tribes, principally the Atonga, the decision was made to initially recruit the Atonga for irregular units as well as the Makua from Portuguese East Africa. After a tough series of fights the slavers were subdued and in 1896 the Protectorate decided to form a local infantry unit named The Central Africa Rifles. About 100 Sikhs were retained as instructors, artillerymen and Post Commanders; officers were seconded from the British Army, and six rifle companies were formed. The Angoni were still not recruited, the Atonga, Yao and Marimba being preferred. During 1896 and 1897 The Central African Rifles engaged the Angoni in three minor operations but in 1898 a more serious situation developed that became known as The Angoni Rebellion. 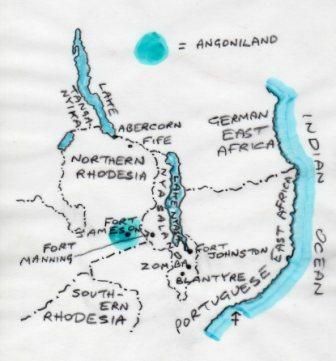 Across the Northern Rhodesian border the Angoni were living around the area of Fort Jameson where a trading company, The North Charterland Exploration Company, tried to fraudulently expropriate Angoni land. This Company used a German named Karl Wiese as their negotiator, and he antagonized Singu, son of the old Angoni chief Mpeseni. Singu and the younger tribal warriors threatened Wiese and other Company Europeans who were at Luangweni near Fort Jameson, where the Fort garrison consisted of only 25 Atonga policemen. The Company urgently requested help from the administrators of Northern Rhodesia, the British South Africa Company. The nearest British troops were the Central African Rifles across the eastern border in the British Central Africa Protectorate, which had undertaken to provide military support for Northern Rhodesia when that was requested. In those days white men stood together first and worried about rights and wrongs to Africans later, if at all. At military headquarters in Zomba the Central Africa Rifles was stood-to and on 2nd January 1998 it marched across the border to reach Fort Jameson 16 days later. Captain H.E.J. Brake, Royal Artillery, was in command and he had with him six rifle companies of Africans, 118 Sikhs, Maxim Guns and two 7-pounder field guns. Each company was commanded by a British officer assisted by a Sikh colour sergeant and three Sikh sergeants. The guns were crewed by Africans under Sikh instructors. The remainder of the Sikhs formed their own rifle company. On 19th January Brake marched the 30 miles north to Fort Loangweni in heavy rain and relieved the small garrison. Next day he moved his force to occupy commanding ground nearby whilst Angoni warriors were observed concentrating a force of around 10,000 warriors in the villages. An Angoni impi advanced towards Brake’s riflemen but when the British opened rifle fire the Angoni threw a few spears and withdrew. The tactics used by the Angoni regiments were based on making sudden rushes of overwhelming strength from concealed positions on enemies armed only with spears. These tactics could not be used against an enemy with rifles who knew how to seize the vital ground before offering battle. During the remainder of the day Brake’s use of Maxims, 7-pounders, rifle volley-fire and finally a silent advance with the bayonet destroyed the Angoni will to fight. The tribesmen did not lack courage but they would not attack into the British volleys. The few firearms that the Angoni themselves possessed were used ineffectively. Singu’s young warriors dispersed. Then a new body of at least 500 warriors in full war dress approached, having come from Chief Mpeseni’s capital. Four artillery shells, a Maxim burst and a bayonet charge that was not faced up to caused the rapid dispersal of the survivors of this 500. Another factor that was observed was that although the Angoni had up to 25,000 warriors the tribe could never concentrate a very large force for any one battle. The tribe had so roughly handled all its neighbours that the other tribes were always on the lookout for signs of Angoni weakness so that revenge could be taken. Therefore all Angoni villages throughout the tribal lands had to be strongly garrisoned at all times. This kept many warriors out of the fight unless it was occurring near their own villages. During the next few days Brake’s men patrolled the area, skirmishing with and completely dispersing the Angoni fighters. On 30th January Singu was captured by Lieutenant J.S. Brogden, Royal Marine Light Infantry. After a trial by Drum-head Court Martial (a swift military trial held in the field) Singu was summarily shot in front of a collection of chiefs on 5th February. Shortly afterwards a mobile column shot and killed Singu’s wife Nkuchwa. On 9th February Chief Mpeseni surrendered and was exiled for a year to Fort Manning, and with his banishment resistance to the British halted. Violence flared up again in Southern Angoniland in April 1898 but a strong British patrol marched through the area and was only confronted by Angoni skirmishers who quickly disappeared. The soldiers who took part in the actions against the Angoni from January to April 1898 were awarded The Central Africa Medal with clasp inscribed: “Central Africa 1894-1898”. The three colours of this medal ribbon are said to allude to the racial composition of British forces in Central Africa – black for Africans, terracotta for Sikhs and white for Europeans. An example of the reverse of this medal and of the ribbon and clasp is shown. In May 1898 an officer from The Royal Lancaster Regiment, Captain Leslie Falkinor John De Vere Stokes, was seconded to the Central African Rifles (notice in London Gazette No 26977 dated 14 June 1898). In December The Central Africa Rifles was re-titled The 1st Battalion The Central Africa Regiment (CAR) and on 1st January 1899 a 2nd Battalion was formed, principally for overseas service. Britain saw trouble in South Africa approaching and so raised 2nd CAR both to relieve white battalions manning certain overseas posts and to have another battalion available for operations against dissident tribes elsewhere in Africa; but the CAR was still not recruiting from Angoniland. Soldiers taking part in these November operations were awarded the new Africa General Service Medal with clasp inscribed: “B.C.A. 1899-1900”. An example of the reverse of this medal and of the ribbon and clasp is shown. On 1st January 1902 the two CAR battalions were re-titled as the 1st and 2nd (Central Africa) Battalions The King’s African Rifles. The Times of 17th June 1902 listed Captain Stokes as attending the Coronation in London in the capacity of Commanding Officer of the 1st (Central Africa) Battalion The King’s African Rifles. Sadly a further notice in The Times on 7th September 1903 recorded the death of Captain Stokes on 24th August at Zomba, British Central Africa. The medals shown were awarded to Sergeant-Major Makanjira, a member of the Atonga tribe, who served in the Nyasaland Police, 1st King’s African Rifles and the Central Africa Rifles. The image appears by kind permission of the Orders and Medals Research Society. This image appeared in an article by Anthony Allen in the March 2008 copy of the Society’s journal. The third medal is the African Police Medal for Meritorious Service.